Adobe Fireworks CS3 was a revelation. 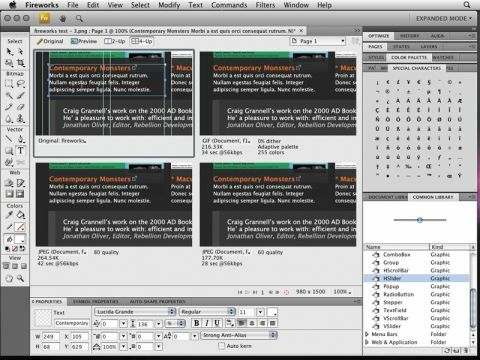 In one fell swoop, Adobe transformed Fireworks from a Photoshop wannabe to a prototyping tool for web designers, offering a raft of new workflow features. The most obvious change to Fireworks CS4 is the interface, which showcases the best and worst of interface design. Adobe's non-standard window widgets make the application look shoddy and cheap and slows things down. The Application bar is a waste of space and confusingly duplicates tools from the toolbar, but uses different icons. However, the streamlined palettes work nicely, and the Application Window model works better with Fireworks than Photoshop – just as well since palettes overlap when you turn it off. Overall, Fireworks CS4 feels less robust than its predecessor. Most other changes appear centred around pinching things from other Adobe applications and updating export functionality. Of the former, Illustrator-like smart guides assist with positioning elements, and type handling is improved a little, although Photoshop-like fields for font selection via typing would be nice. Getting PSD files into Fireworks is still hit-and-miss, but the new PDF export feature is impressive, enabling you to create an offline site prototype that a client can then comment on using the likes of Acrobat. We didn't find the new CSS export feature nearly as solid, however, and our dreams of one-touch export of standards-based websites were left in tatters. As a new purchase, Fireworks CS4 has much to recommend it, but CS3 users should wait for Fireworks CS5.